So I think I’m about five years late to this party. But I am newly, and really, obsessed with dates. They are so good. How are they so good? I don’t know how I was so woefully misinformed, but up until a couple months ago I had this idea that dates were just a vague something to be nibbled on at your grandmother’s house if all the cookies were gone, or maybe used as a convenient vehicle for goat cheese and bacon, or admired from afar as a healthful “substitute-for” things I am generally reluctant to substitute. And then I was gifted a box of really great ones, with fancy things like orange peel and almonds tucked inside, and my world was totally rocked. This is probably news only to me at this point, but it turns out dates are pretty much candy. They have a consistency like caramel and nearly the same buttery taste; they’re sticky and soft and reminiscent of wonderful things like honey, cinnamon and molasses. B2 was unmoved by my date revolution (although he hasn’t gotten tired of responding to “Want a date?” with “I thought we were already married. Get it?”) but, with or without him, I’m fairly sure I’ve eaten my weight in them since April. Because their distinct warmth seems perfectly suited for cold weather (well, of course, sticky toffee pudding), I’ve been waiting for holiday season to roll around so that I can tuck dates into every cozy-weather dessert I can think of. 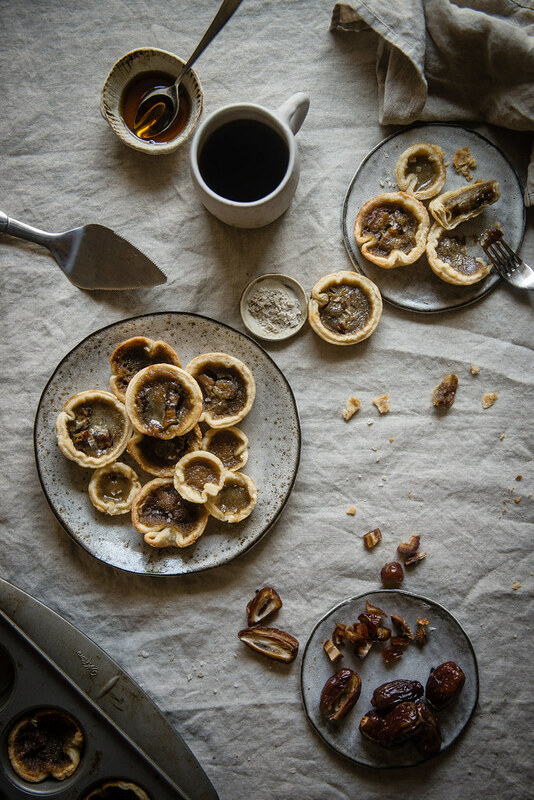 And the first (of many) is these butter tarts! 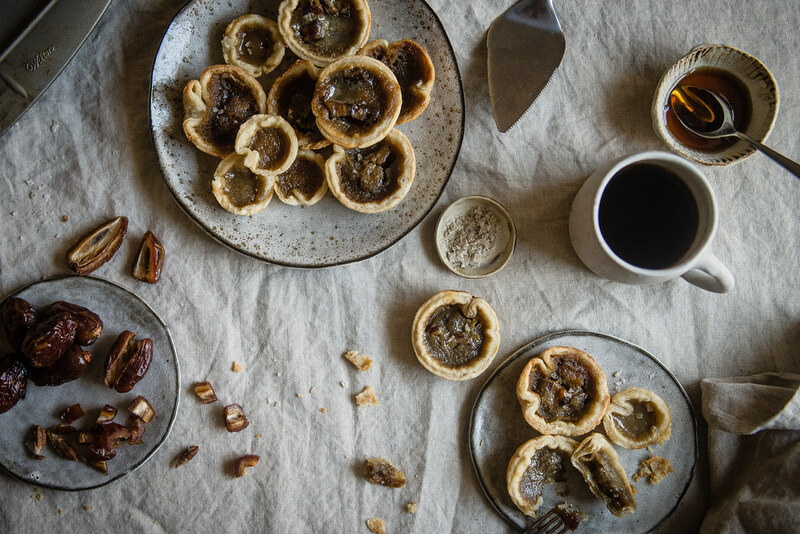 Butter tarts are a Canadian beauty I’ve been meaning to try ever since I noticed they were kind of like a pecan-less sister to pecan pie. (Because I’m the wicked stepsister who likes eating all the pie filling from underneath the pecans and leaving the nuts. I mean, what?) Gooey and molten with a brown sugar and, here, maple syrup filling, I couldn’t imagine anything more perfect to introduce to honey-sweet, toffee-like dates. Lo and behold, their mellow, dulcet flavor and chewy texture fit right in, and the filling was every pecan-less pecan pie dream I’ve ever had fulfilled. For an extra touch of holiday decadence, the crust here incorporates a few tablespoons of Vermont Creamery crème fraîche. After seeing sour cream pie crusts here and there, I wondered whether crème fraîche might work the same way in producing a crust that’s a bit easier to roll out but just as tender and flaky, and it turns out that was exactly the case! I love crème fraîche the more I cook with it, for its ability to step in for both sour cream and heavy cream in so many applications — it’s rich, so not for every day cooking, but every once in awhile, it’s perfect to make food feel a little festive. I’ll be pairing up with Vermont Creamery again next week to use it a savory recipe, too! Thank you to Vermont Creamery for sponsoring this post! All opinions are, as usual, my own. 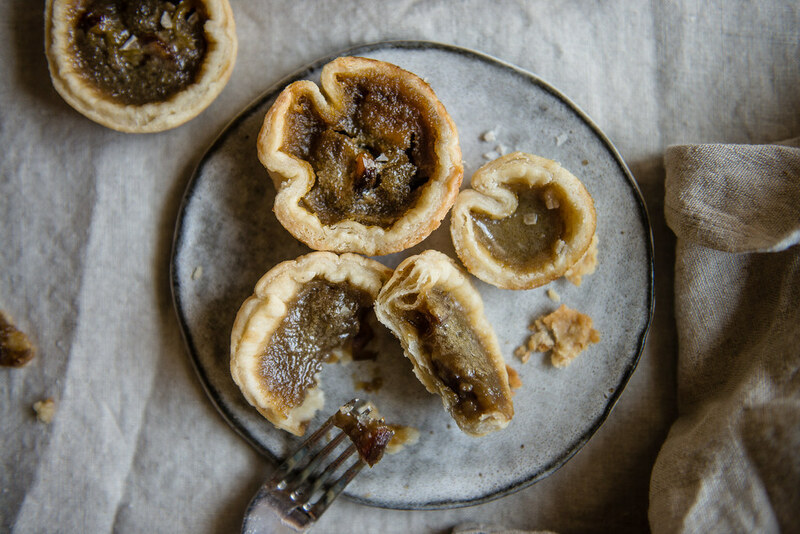 In these tarts, chopped Medjool dates, my favorite for their soft, plump texture and sweetness, take the place of the raisins that occasionally make their way into butter tarts. I hear that whether to include raisins in traditional butter tarts can be a source of deep ideological divide, so for those on the no-raisin side, dates might not be much of an improvement. In which case, feel free to omit! Recipe inspired by Crepes of Wrath and Canadian Living. To make the crust: Let the butter thaw briefly at room temperature, about 5-10 minutes. (Alternatively, if all you have is refrigerated butter, pop it in the freezer for 30 minutes prior to making the crust.) In a large bowl, combine the flour, salt, and sugar, and mix until well-combined. Using the coarsest holes on a box grater, grate the slightly-thawed (or slightly-frozen) butter into the flour, then mix gently with your fingers to incorporate it into the flour, just until the butter forms pea-sized clumps. Whisk the creme fraiche and two tablespoons of the ice water together in a small bowl. Drizzle the mixture over the flour mixture and stir with a wooden spoon until the mixture comes together into a pebbly, shaggy dough. If the mixture holds together when squeezed, it has enough moisture. If not, add more of the ice water, a tablespoon at a time, until it does. Gather the dough into a disk, wrap it tightly in plastic wrap, and place in the refrigerator to chill for at least an hour. Preheat the oven to 400 degrees F. Roll out the pie crust to about 1/8" in thickness, the thinner the better. Use a 4-inch biscuit cutter to cut circles in the dough, then gently transfer them one-by-one to a standard-size muffin tin and press them into the wells. Re-roll the scraps as needed. You should be able to get about 10 to 12 dough circles. Once all the muffin wells are filled, place the tray in the freezer to chill the shells while you make the filling. To make the filling: It couldn't be easier -- just whisk together the brown sugar, maple syrup, egg, melted butter, salt, and vanilla (if using) until well-combined. Chop the dates if you haven’t already. 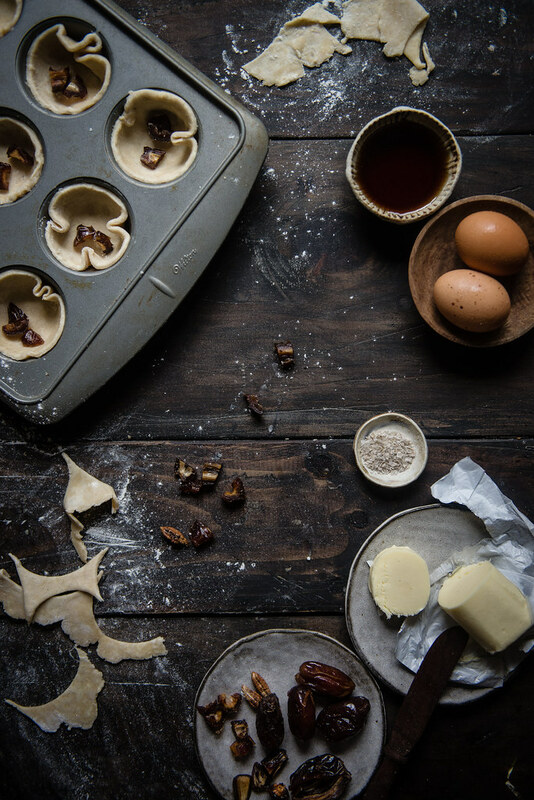 Remove the shells from the freezer, place a few date pieces in each muffin well, then drop about two tablespoons of filling into each tart, leaving at least 1/4-inch of the crust visible to prevent overfilling. Bake for about 15 minutes, until tops are bubbling vigorously and pale golden, and crusts are golden-brown on the edges. Allow to cool slightly, then run a paring knife around the edges to loosen the tarts if the filling has overflowed, remove and enjoy. Tarts freeze very well for at least a few months (and, like Sydney suggests, they're even better out of the freezer). 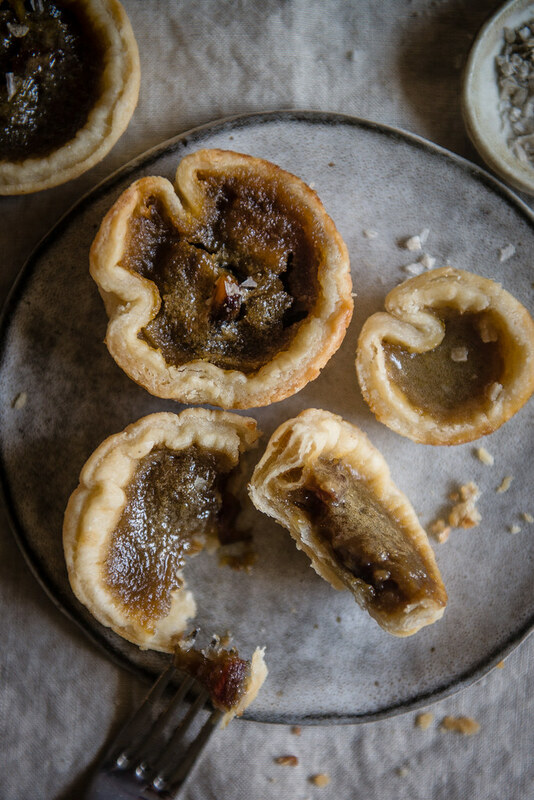 These are butter tarts that err on the side of less-gooey -- if you like a runnier tart, increase the maple syrup to 6 tbsp and bake the tarts for less time, about 12-13 minutes. Also, on dates! If you're having trouble finding good ones, Nuts.com offers ridiculous quantities that are consistently delicious -- I really love their Medjool and Khadrawi dates. These are absolute lovliness and I am totally with you on the date bandwagon. They are like God’s gift to humanity because, like you said, they’re like candy but we can still all consider them healthy. These maple tarts sound divine and what a perfect addition these would be to the Thanksgiving dessert selection. p.s. B2 cracks me upevery time you mention him! YES!! And then I eat about ten at a time … and just tell myself “it’s fruit.” Thanks so much for the kind words, Tori 🙂 and for your PS, which B2 totally loved. Haha! Oh my gosh, I am fascinated by Ecclefechan tarts. Next time!! PS Nope, I’m not really sure how they differ, other than the extras in the filling! I’d love to hear what you find! Thank you so much, Sophie!! Well better late than never, right? My mother always had them at home, but I always tought them to be too dry and was not a big fan. But then I tried fresh ones and I fell in love. These pies look delicious, but since I am in love with nuts, I will add a sprinkle of chopped nuts on top. Brown sugar, maple syrup and dates – what a dreamy combo! 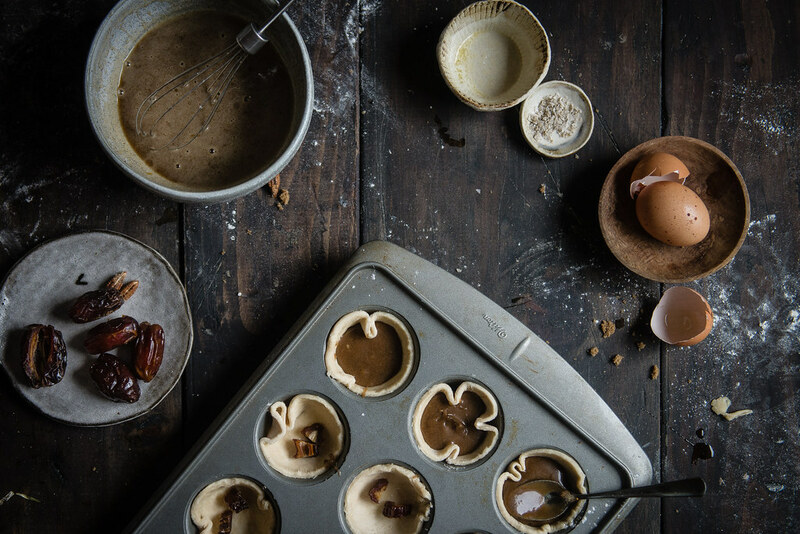 Adding dates to your butter tarts is such a wonderful idea! These sound great! Phew, I’m so glad to hear that from a real Canadian!! I felt a little sacrilegious borrowing this perfect dessert from you guys. 😉 Thanks so much for the sweet words, Katrina! Oh my this looks so good! I’ve done a sour cream crust before (I pretty much stick to the butter + cold water one), but this crust looks incredible – I’ll have to give it a try. I can just imagine the richness and flavor it can add to crust. I’m so obsessed with VT Creamery’s creme fraiche – I pretty much keep a constant stock of it now in my fridge :). PS – this looks so dreamy and magical. Oh man! These remind me of a Filipino dessert that I always eat a boatload of whenever I’m in the Philippines. They’re basically the same thing, but with a shortcrust tart shell and date and brown sugar filling, topped with nuts. So good. It never occurred to me that I could make something like them at home until I saw your post, lol! Funny how that sometimes happens. I recently discovered medjool dates too–and think they are fantastic! I’ve been wanting to try to use them as a sugar substitute in some baking, but haven’t gotten around to it yet. 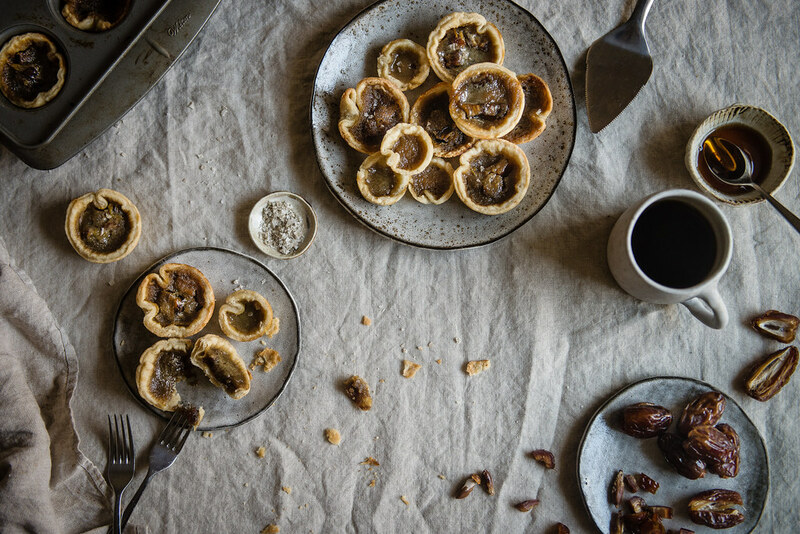 These tarts sound absolutely perfect. I mean, I love anything with butter in the name. 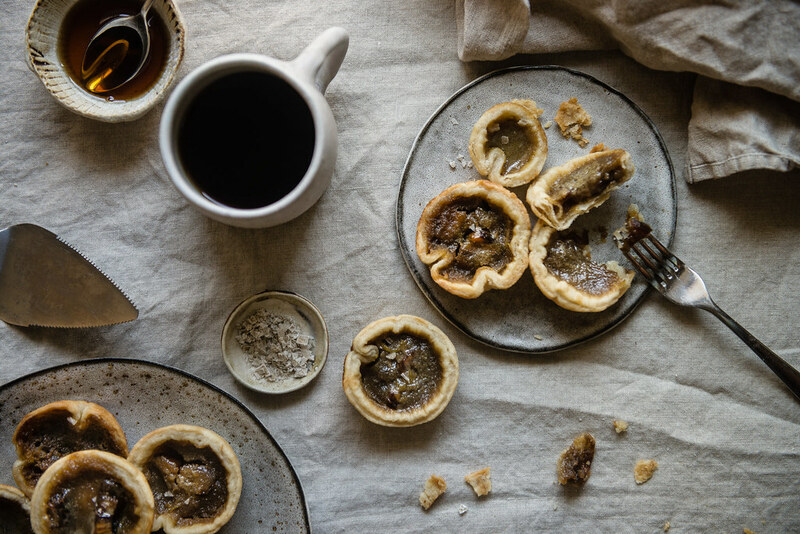 I have never had a butter tart but your photos are so gorgeous, I’ll have to try them. Looks like this would be a hit on my Thanksgiving table. Beautiful! I love the idea of adding creme fraiche to the crust. And what beautiful baby tarts these are. I’ve never heard of butter pies, but now I’m swooning over these. Totally obsessed. I’ve never had a butter tart yet?! That needs to change. Yours look so beautiful – love the neutrals in each shot!!! Also, B2’s response to your date love – sounds almost exactly like something Andrew would say, which made me smile. Oh, B2!!! <3 <3 <3 You guys are the cutest and I am so glad you're on the date train!!! YES I am newly obsessed with dates too!! It wasn’t until I had some really soft, sticky medjool dates that I was like WOAH these are so molasses-y and amazing. I’m loving chopping them up and stirring them into oatmeal with peanut butter at the moment :))) Maple syrup, dates and pecans sounds like a DREAM combo – definitely something I’m gonna have to make. 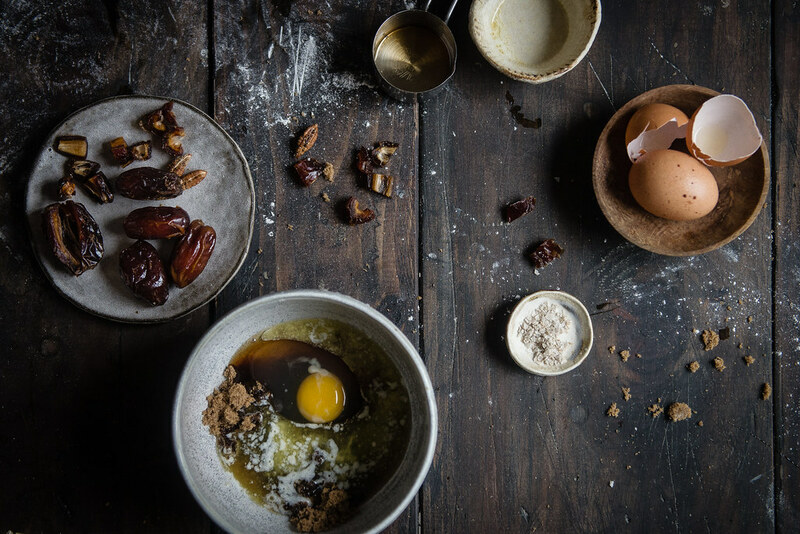 I’m quite obsessed with dates, and I use it to make a crust for sweet treats all the time. These tarts look wonderful! Wow your recipes are incredible!!! I adore your pictures!! Great Blog. These look amazing! I love your photos so much. Just picked up Medjool dates at Costco yesterday. They are from CA and very affordable. Two of them are my “dessert” when I want a little something sweet after a meal. Definitely going to try this recipe. First as written, and then maybe substituting my homemade apple cider syrup, made from our fall community apple pressing party. Can’t image only one batch will do – especially as they are good frozen. Thanks for the post! Made this yesterday for an afternoon tea get together, they were absolutely outstanding. I used a gluten free pie crust recipe but followed your directions for assembly and baking and they were so lovely. Also, I used 1/2 cup of chopped dates and 1/2 cup of chopped walnuts. Thank you so much for a wonderful recipe, I’ll certainly be making it again! I made these the other day for a party and they were a huge hit! Dates are super expensive in The Bahamas so I used the cheaper deglet noor variety. I also swapped sour cream for the crème fraîche. People couldn’t get enough of them. Thanks! I am so thrilled, Gabrielle!! Thank you so much for making the recipe and for letting me know. (And so glad to know that these substitutes worked!) This made my day — thank you. butterscotch mochi bars // a common table giveaway!